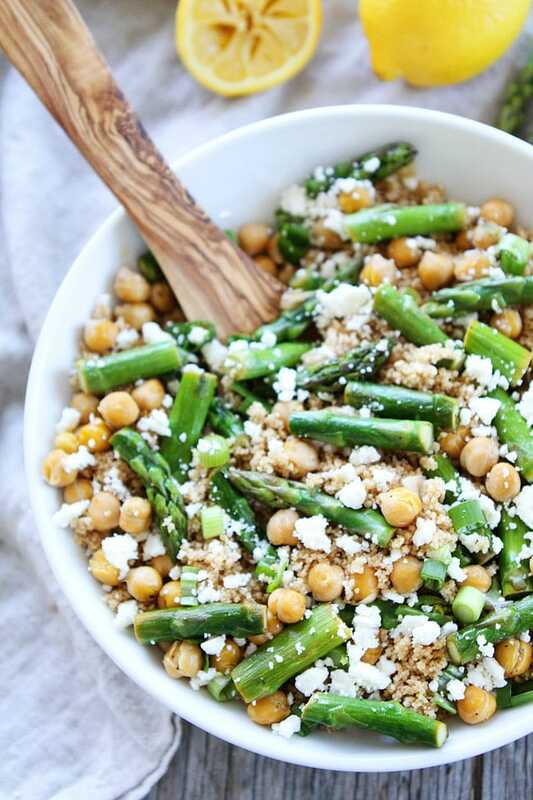 This Asparagus Chickpea Quinoa Salad with feta cheese and a simple lemon vinaigrette is perfect for spring. 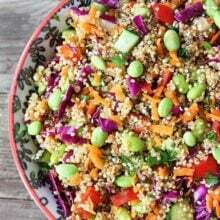 I love making quinoa salads because they are healthy, hearty, and delicious. 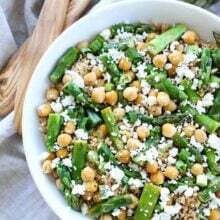 To this quinoa salad, I added roasted asparagus, chickpeas, green onion, feta cheese, and a simple lemon vinaigrette. It is super simple, but super delicious. Sometimes the simple recipes are the best recipes! The asparagus is the spring star of the salad. I try to eat as much asparagus as I can during the spring months and it is so good in this salad. I also add chickpeas because I like the protein boost. I enjoyed this salad for lunch and it was plenty filling as a meal, but you could serve it as a side dish too. It would be great with chicken, fish, or steak. It would also be a great salad to take on a picnic or to a potluck party. 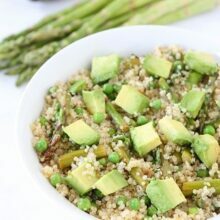 Bring a little spring into your kitchen and make this easy Asparagus Chickpea Quinoa Salad. 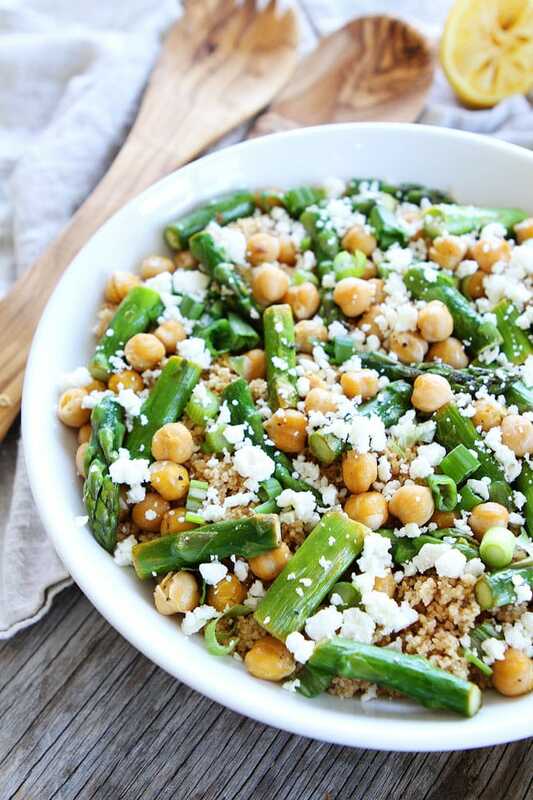 This simple quinoa salad with asparagus, chickpeas, and feta can be served as a main dish or side dish. It is a springtime favorite! In a small bowl or medium jar, combine the lemon juice, olive oil, mustard, and garlic. Whisk to combine or shake with the jar lid on tight. Season with salt and pepper, to taste, and set aside. While the quinoa is cooking, cook the asparagus. In a large skillet, heat the olive oil over medium heat. Add the asparagus and fresh lemon juice. Cook until tender, about 5 minutes. 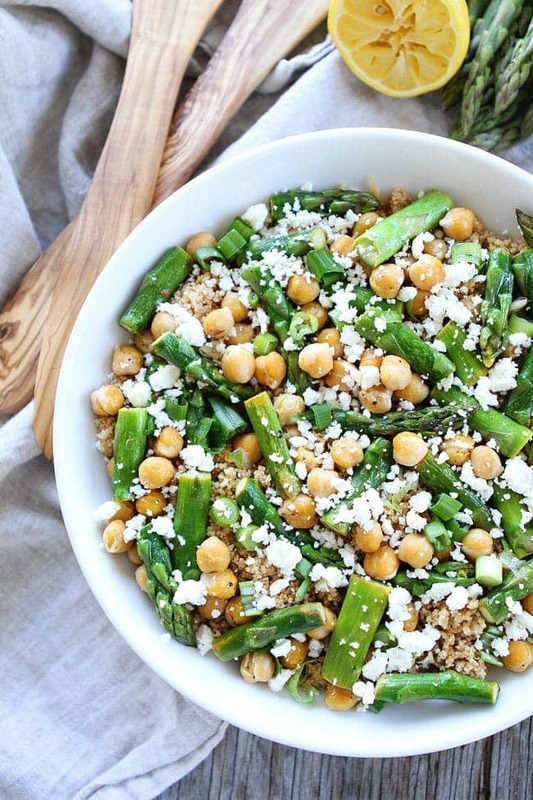 In a large bowl, combine quinoa, asparagus, chickpeas, green onion, and feta cheese. Pour the dressing over the salad and stir until well coated. Season with salt and pepper, to taste. Serve. Note-if you need the salad to be vegan, you can omit the feta cheese. hey girl- this looks so tasty! Y’all have a great weekend! 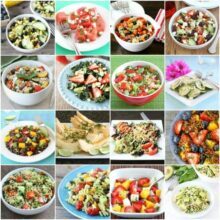 This salad is so “me.” I love all the components, and the photography is gorgeous! Yum! LOVED THIS SALAD!!! Super easy to put together. The lemon vinagrette tasted so fresh. This will be a springtime staple! I love this! What a great salad! This is just like spring in bowl! So pretty! This salad looks so refreshing! I want to try it soon! Just made this tonight minus the feta as my husband doesn’t like it, but I’ll add if on my own portion as I love feta!!!! Thanks for another winner have a great evening. Glad you enjoyed the salad!! Do we serve this salad cold or warm??? I enjoy quinoa and really enjoyed this recipe! This was so good! Followed exactly but roasted the chickpeas, spiced with garlic powder and S&P first. Everyone LOVED it! Can’t wait for the leftovers. 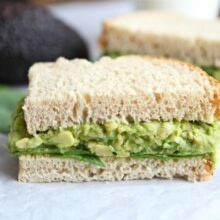 I made this recipe on a whim – just found it while looking for a recipe with asparagus. Wow, was it a hit – everyone loved it and has been craving it ever since! Thanks for the recipe! I’ve made this several times and love it. I use cannellini beans rather than garbanzo, and sometimes add cut cocktail tomatoes.